Here’s a little known fact. I’m an East End girl at heart, actually born within the sound of Bow bells and therefore perfectly entitled to go a little bit giddy at the prospect of a Hackney Bun. I have my newest cook book splurge, Lily Vanilli’s Sweet Tooth, to thank for the introduction to Chelsea’s edgy little sister, and having given them a go, I’m hooked and can’t recommend them enough. What sets the Hackney Bun apart is the Guinness-soaked fruit, bringing a bittersweet, malty stickiness that’s almost too cool for school. This recipe is taken from Lily Vanilli’s Sweet Tooth, a truly wonderful baking bud that’s currently taking pride of place in my cookery book collection. 200g jar of caster sugar (you will only need 25g of this mix to cover the buns, but keep the rest sealed in a jar for a delicious, flavoured sugar. Simply mix the spices evenly through the sugar and you’re done). you will need – a 25cm square baking tin lined with baking parchment. Heat the milk and butter in a small pan and allow this to cool until tepid. Next up mix together the flour, salt and sugar, making sure that everything is evenly distributed. Now, if you’re using fresh yeast you’ll need to whisk this into the butter and milk, followed by the egg yolks but if like me, you’ve gone for fast action yeast, then add the yeast into the dry ingredients and just the egg yolks into the butter and milk. Either way, the next step is to pour in the wet ingredients and bring the dough together roughly in the bowl. To knead the dough by hand, flour the work surface and expect to be kneading for at least 20 minutes. If you have a mixer with a dough hook then you’re looking at 10-12 minutes on speed 6. You now need to leave the dough to prove for at least an hour, I went for an hour and a half, in a warm place. I cover mine with a clean tea towel and whack it in the airing cupboard, works every time. After the dough has almost doubled in size, roll it out on a floured surface into a large rectangle, around 25 x 35cm will do it. Brush all over with the melted butter and then sprinkle over the dark brown sugar and soaked fruit, keeping the Guinness syrup to one side. Roll the whole thing up lengthways, as tight as possible, and brush over some more of the melted butter. Cut the rolled dough into roughly 2cm slices and place them on their sides into the prepared tin. Make sure to leave a small gap between the buns to allow for them to rise further. Prove the buns for another 20-30mins. Preheat the oven to 200°C / Gas Mark 6 and bake the now risen buns for 20-25mins. They will be done when your kitchen smells heavenly and the buns are a golden brown colour. Leave the buns to cool in the tin for 10mins and during that time, brush over the Guinness syrup and sprinkle over some of the spiced sugar. Finish cooling the buns on a wire rack for as long as you can stand it, then devour them. 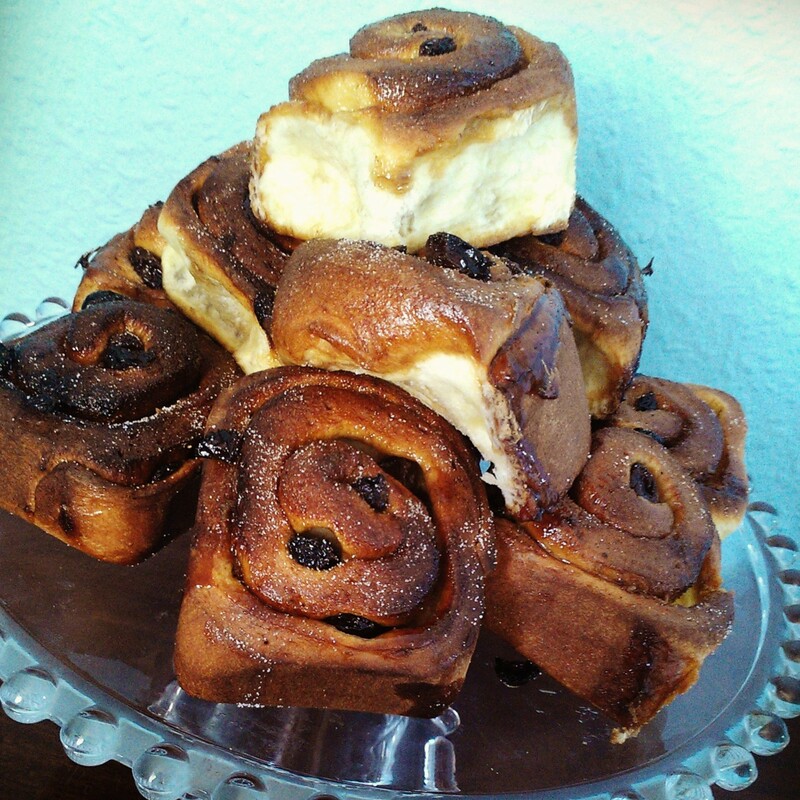 This entry was posted in Bread, Buns and tagged baking, baking recipe, bun baking, bun dough, bun recipe, buns, enriched dough, Hackney buns, Lily Vanilli by Natalie Glock. Bookmark the permalink. Oh what a scrumptious mountain of unadulterated carbohydrate joy! Those look astounding. Thanks v much! They’re delish. Ah what a good idea! I know! Such a good recipe, the boozy fruit really makes a difference. Thanks for the comment.